In July and August, I'd made two posts in which I shared some of the images from the French-language edition of the D&D Basic Set I received back in the early 80s. Here are a few more, this time from the monster section. My apologies if the scans of some of them are a little blurry toward one side. In some cases, I'm not certain who the artists associated with each image are, so please let share any insights you have in the comments (or correction when my attributions are mistaken). These are acolytes drawn by Timothy Truman. This is a cube gélatineux by Jim Holloway. A furet géant by Jim Holloway. A gorille blanc by Jeff Easley. An imitateur parfait by Timothy Truman. Limon vert by Jim Holloway. An ours-hiboux by Jeff Easley. A troglodyte by Jeff Easley. It's a very idiosyncratic collection of monster illustrations. 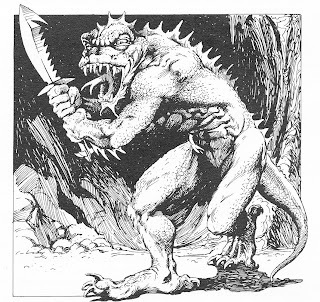 I find myself, in retrospect, wondering why these particular monsters were chosen for illustration rather than others that are either more "iconic" to D&D or else harder to visualize. 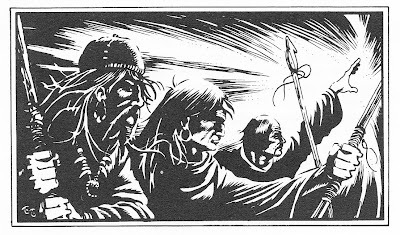 Mind you, I feel that way about the illustration choices in many roleplaying game books, so it's not unique to the French-language version of Dungeons & Dragons. After your article "The Man behind the Madness", I had meant to post this link to a French Kickstarter that is making an English Translation of a Celtic/Lovecraftain/Medieval RPG. Not sure if it is strictly your cup of tea ... but after picking up a copy at GenCon, I found it pretty interesting. YMMV. Hi, I'm afraid a couple of pieces attributed to Elmore are actually by Holloway... That does not look like Elmore's style at all. These pictures were such icons for me during the last 28 years, I can barely think it was a privilege for us french players to have them in our Red Box. That troglodyte image is wonderful, and I love the term "ours-hiboux". Even though it differs from other canonical presentations pretty significantly, I'm digging the ours-hiboux. I agree with Luigi that the "Elmores" above are actually Holloways. Limon vert sounds like a dessert rather than something that will corrode your whole body into a pile of goo. Thanks for posting these; always great to see "lost" classics. 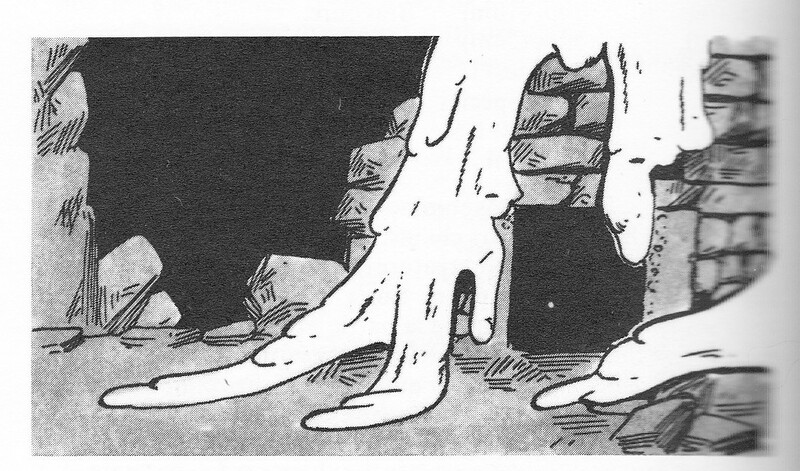 And alternate visualizations of monsters without or before they became "canonically" visualized are things to be savored -- Truman's doppleganger (funny to see a German loanword isn't good enough for the French) is striking. It reminds me of Erol Otus' wind walker for the AD&D Monster Cards. Remember, Elmore had a looser, cartoonier style associated with Snarf Quest and some editions of Gamma World that didn't look like the stuff in the US D&D boxed sets, let alone his painted work. Much more ominous than owl bear for sure. The beast in the illustration is certainly scary enough! And I like the way its prowling along rather than the usual way Owlbears are illustrated standing upright on two legs. 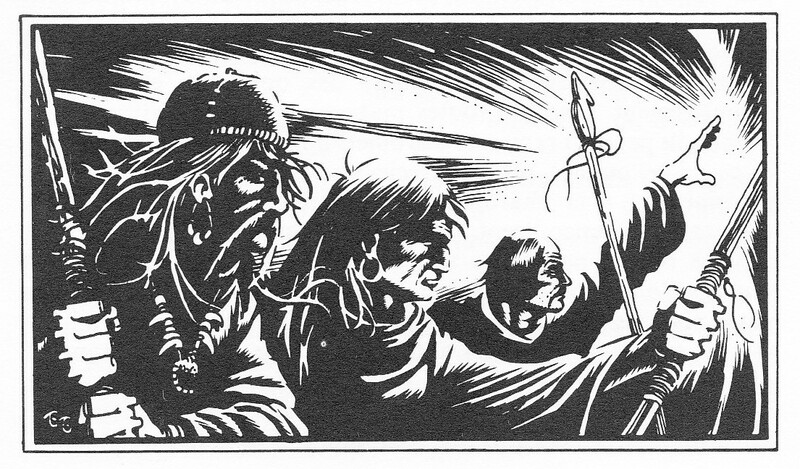 Yep...from here on out, the proper term in my games is now "Ours-Hiboux"
"I'll start with a glass of 'gorille blanc' and for dessert an 'imitateur parfait' for her and 'limon vert' for me"
I had no idea Tim Truman ever did RPG art --- loved his style on the Grimjack comic book back in the 80s. Now of course he writes Conan comics but doesn't draw them. Can one get drunk from a Limon Vert?